Challenge family, friends and classmates to see who can be the first to complete the printable word maze puzzle. Great for vocabulary building and problem solving skills. 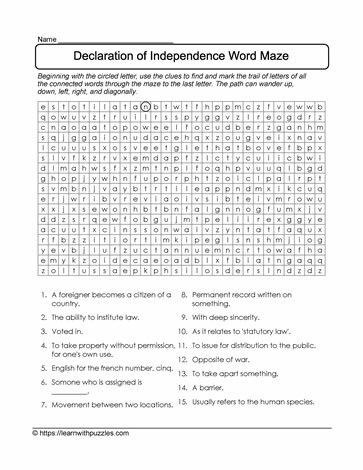 Use the Declaration of Independence word clues in the word bank to determine the word hidden in the word maze. Start at the circled letter, and mark the trail of the connected letters to complete the printable puzzle. Suitable for students in grade 7,8,9 classrooms, and as a review or summary for homeschooled students. Consider use with students in grade 4,5,6 classrooms with differentiated instruction as required.